The Western Reserve United Methodist Church serves as an oasis of hope in our busy world. Located in the historic Connecticut Western Reserve, our church offers the "personal touch" of Jesus Christ to you and the world. As you browse this website you will find opportunities for fellowship, service, outreach and education. I truly believe that Western Reserve is a special place. God is doing something unique here. I came to this congregation in 1994 and have experienced God's grace through the people in this church. I am not alone. Many have grown closer to God through our ministry. It is my sincere prayer that you join us and become a true disciple of Jesus. I invite you to become part of the Western Reserve family. 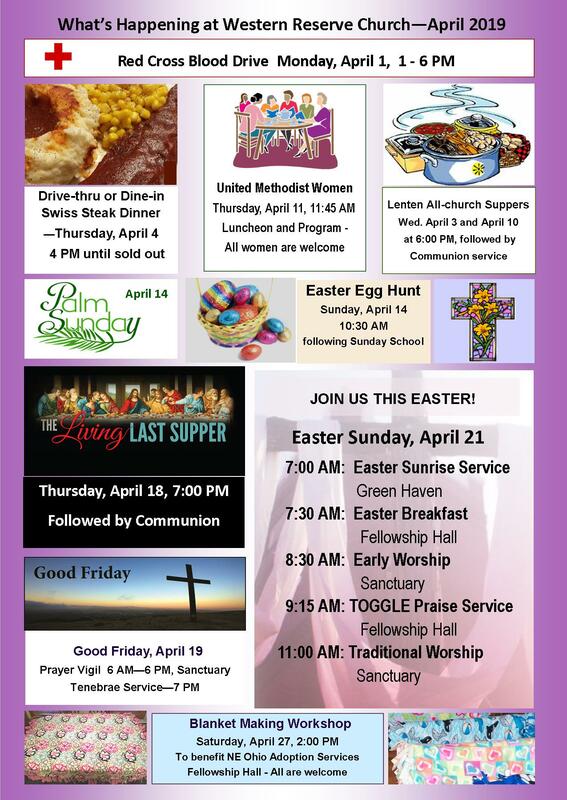 Western Reserve United Methodist Church offers three worship services each Sunday, at 8:30, 9:15 and 11:00 AM. Holy Communion is offered at all services the first Sunday of each month. For information on the locations and worship styles for each service, click here. Coming May 3-4: Annual GAB Sale - Bring your gently used items to the church April 29 - May 1. Help needed sorting, pricing and transporting, help also needed during and after the sale. Call JoAnn at (330) 318-7952 for more information. Our building and sanctuary are both completely handicap accessible. The mission of the Western Reserve United Methodist Church is to develop disciples who reflect Christ's love through worship, fellowship and service. Gently used clothing for the entire family at fantastic prices! Stop in during Tuesday hours or make an appointment. Donations accepted any time. Come and help make tied fleece blankets for children in foster care. All skill levels welcome. Sponsored by the UMW.